Bank of Books is an emporium of all things literature, with its Main Street location just far enough off the beaten path that many visitors don’t know it exists. On the ground floor are shelves upon shelves of titles — look for mystery, horror, and literary novels, as well as a wide range of cookbooks. Step down into the basement for novels from the world over and a true museum of rare, out-of-print novels, some many decades old. Take a detour from the Ventura Pier along the bike path and you’ll come to San Buenaventura State Beach, where the Jolly Oyster slings freshly farmed oysters. 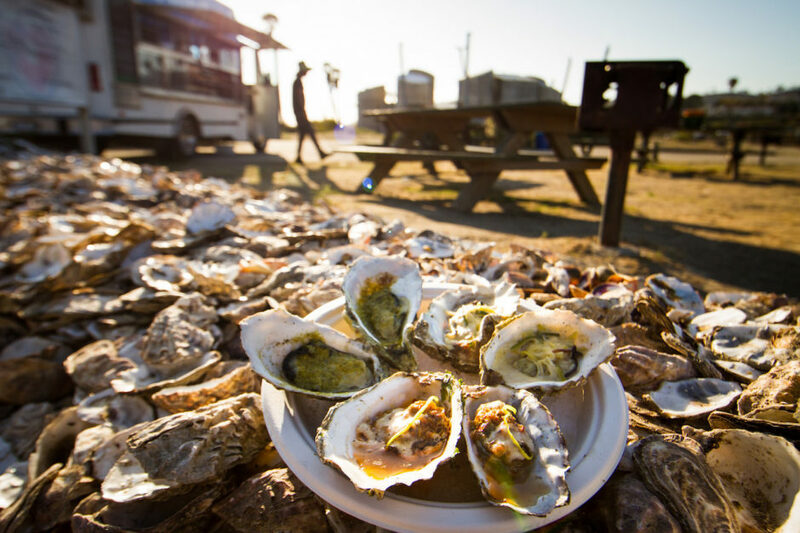 Because Ventura’s weather is practically perfect year-round, locals bring their families, friends, and dates out to the park to shuck oysters by the dozen — pretty much on a weekly basis. The Jolly Oyster sources their little bivalves from Baja, Mexico, from their own oyster farms, and sells them by the dozen. Locals visit the Shuck Shack and grab Kumamoto and Pacific oysters for shucking with a bottle of Pinot Grigio (you can bring your own to the park) and red wine vinaigrette, or grab a box of fried oysters from the permanent Jolly Oyster kitchen truck that also whips out oyster tacos, chowder, and baked oysters. Located next to the 101 freeway is Tony’s Pizzaria, sitting just where it has been for almost 50 years, a few blocks west of Main Street. The wood-burning oven gives Tony’s pizza its signature crispy crust and is well worth the wait. Picnic tables on the patio provide seating under the giant leaves of palms and ferns, giving the joint a real Ventura beach vibe in spite of its Italian roots. Sure, it’s a few blocks off Main, but it’s a taste of the original Ventura. You’re spoiled for choice when it comes to Mexican food in Ventura. It’s in our blood, after all, and while many restaurants are fine enough, Venturans go to the Avenue for the best in the city. Ventura Avenue is the city’s original drag, stretching from just after the Fairgrounds and heading up toward Ojai. Along the way, countless restaurants and bodegas stand as landmarks. There’s Taqueria Tepatitlan, featuring signature mole dishes on certain nights, not to be missed; Taqueria Cuernavaca is what Avenue residents call “authentic,” where the al pastor is accentuated with sweet pineapple; and El Jarocho, a tiny hole-in-the-wall serving up the best ceviche and shrimp cocktails in the county. The day after New Year’s Eve is the best for a restaurant crawl along the Avenue, as many shops serve their very own menudo, the crimson hangover cure filled with hominy and tripe. That said, the Avenue is your best friend after any long night out. It’s kind of hard to call it a secret when it’s promoted by the tourism board, but the Ventura Harbor Trolley isn’t just for tourists. While anyone can hop aboard the 1920s-themed trolley, replete with bells, and ride to the Ventura Harbor from downtown, locals use it as responsible transportation for a day at the beach with a bottle of wine or two. If you’re in downtown Ventura, the trolley is a half-hour ride or so to the Harbor, where you’ll find a handful of eateries, water sports, and a mellow stretch of sand known as Mothers Beach. The protection from the waves provided by the jetties here makes it a great spot for families or visitors with little ones looking to play in the ocean. Ventura may be known as a “sleepy seaside village” to outsiders, but in the world of surfing it’s a superstar factory, birthing the likes of Timmy Curran, Nick Rozsa, and Matt McCabe. Many of these surfers — and many of Ventura’s army of board riders — go to Emma Wood State Beach to catch a wave. In the winter, when the waves are at their best and the temperatures are mild, competition at other beaches can be tough for surfers; at Emma Wood, you’ll see locals flipping and twirling through the air practicing for competitions — or just having fun. Farther down the beach is Mondos, a popular destination for beginners and kids alike. Venturans aren’t overly protective of their beaches and won’t make visitors feel unwelcome, but they do enjoy having a place to call home on the water. Head over to the west end and you’ll find the beginning of the Ventura River Trail, an incredible paved bike path 17 miles long, ending in downtown Ojai. The full trail is actually two combined, the aforementioned section merging with the Ojai Valley Trail. The transition is made seven miles up the path at Foster Park, home to a defunct amphitheater built in the 1920s. The trail features in dozens of officially sanctioned races, but most Venturans use it as an excuse to get some exercise and enjoy the views. The 17-mile one-way journey is a challenge; the steady incline taunts you to turn around all the way up into the hills. The return is a breeze, the downhill trajectory making for sweet riding — a payoff that’s certainly worth the effort.